Frequent readers of this site and attendees of our tour events over the past year or so may well have met one of our favorite legislative candidates in this cycle. Over the weekend Republican Stewart Cathey, Jr., of Monroe, announced he’s running for Senate District 33 – the seat being vacated by Mike Walsworth due to term limits. It’s a Ouachita Parish-centric seat, but it has chunks of Morehouse, Union, West Carroll, Lincoln, and Claiborne Parishes as well. This isn’t Cathey’s first run for the Louisiana Senate. He was a candidate back in 2015 for the Senate District 35 seat Jim Fannin currently holds, and in that race something quite unusual happened. Namely, that Cathey was arrested in late September of that year. Why? For an unpaid traffic ticket – he was issued a ticket in 2009 by a Monroe city policeman for not wearing his seatbelt and Cathey hadn’t paid it. He had a good reason for the oversight, which was that he had been serving in a combat deployment in Afghanistan. There was a pretty sizable stink made over the arrest at the time, as a lot of observers saw it as a political hit by the old-boy network in Monroe on behalf of Fannin’s campaign. The previous holder of that seat, Republican Bob Kostelka, was a Fannin ally and the two had shared a campaign manager – a man named Eric Mahaffey. It goes further than that. Mahaffey was overheard bragging about playing a role in pulling that September surprise on Cathey, and when it happened it left a bad taste in a lot of mouths in Northeast Louisiana. More about Mahaffey in a second. Cathey, after the 2015 Senate loss, re-upped for another tour in Afghanistan in 2016-17. He’s a decorated veteran and a major in the US Army Reserve, and he ended up managing some $250 million in infrastructure projects during his time in that country. Back home he runs the Cathey group, which has commercial and agricultural real estate holdings in the northeast part of the state. And Cathey changed residences in order to move into Walsworth’s district, which was coming open this cycle due to term limits. He made his peace with Fannin, who didn’t appear to be involved with the “unfortunate incident” during the 2015 campaign, and has Fannin’s support for this race. Cathey has also picked up positive notices from a bunch of the institutional players on the Republican side, and it’s likely the business trade groups and others like the Louisiana Committee for a Conservative Majority will line up behind him from what our sources tell us. But Cathey has an opponent, a fellow Republican named Wade Bishop. And Bishop’s campaign consultant is – you guessed it – Eric Mahaffey. Which lends a bit of flavor to the race. 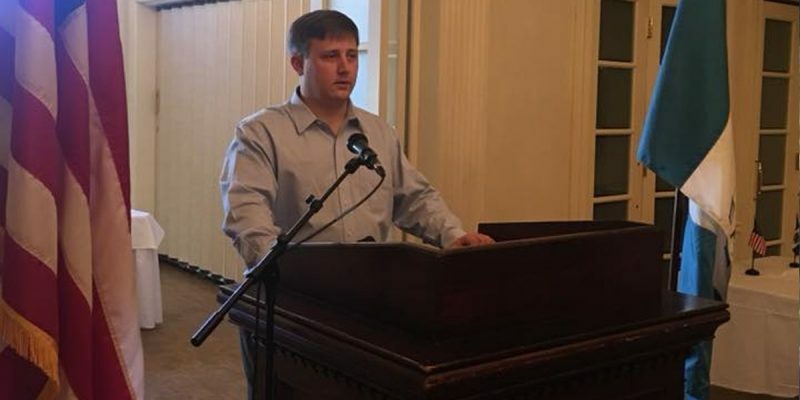 To add to that, Cathey’s consultant is Adam Terry – a veteran North Louisiana and DC political operator who served as chief of staff to former congressman Rodney Alexander and his short-lived replacement Vance McAllister. Terry knows Northeast Louisiana as well as anyone in the business, and this year he has multiple clients who are running against Mahaffey clients in legislative races this year. Among them is a very interesting race just west of Senate District 33, in which Terry’s client Douglas Brown, like Cathey a combat veteran and currently a rice and crawfish farmer, is running against Natchitoches Parish assessor Louie Bernard for the District 31 Senate seat vacated by Gerald Long via term limits. It looks like Cathey’s team has the advantage this time. But the race is likely going to produce some classic Louisiana campaign stories. Hopefully nobody ends up arrested this time.